422 pages | 6 B/W Illus. 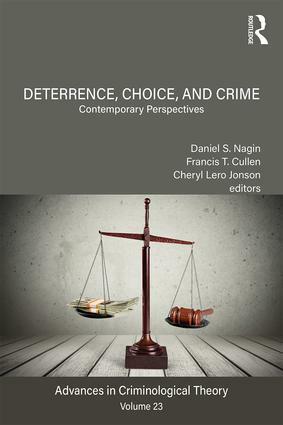 Deterrence, Choice, and Crime explores the various dimensions of modern deterrence theory, relevant research, and practical applications. Beginning with the classical roots of deterrence theory in Cesare Beccaria’s profoundly important contributions to modern criminological thought, the book draws out the many threads in contemporary criminology that are explicitly mentioned or at least hinted by Beccaria. These include sanction risk perceptions and their behavioral consequences, the deterrent efficacy of the certainty versus the severity of punishment, the role of celerity of punishment in the deterrence process, informal versus formal deterrence, and individual differences in deterrence. The richness of the volume is seen in the inclusion of chapters that focus on the theoretical development of deterrence across disciplines such as criminology and economics. In an innovative section, the role of agents of deterrence is considered. Lessons are learned from the practical applications of deterrence undertaken in the areas of policing, corrections, and the community. The closing section includes Michael Tonry’s "An Honest Politician’s Guide to Deterrence: Certainty, Severity, Celerity, and Parsimony," a reminder of Beccaria’s dictum that "it is better to prevent crimes than punish them." In the current environment, deterrence arguments are routinely used to justify policies that do just the opposite. Ray Paternoster, who contributed two chapters, passed away as this volume was being finalized. Fittingly, this book is dedicated to him and ends with Alex Piquero’s poignant remembrance of Ray, a path-breaking deterrence scholar, beloved mentor, and ardent supporter of social justice. Suitable for researchers and graduate students as well as for advanced courses in criminology, this book breaks new ground in theorizing the effects of punishment and other sanctions on crime control. Daniel S. Nagin is Teresa and H. John Heinz University Professor of Public Policy and Statistics, Heinz College of Information Systems Management and Public Policy at Carnegie Mellon University. Francis T. Cullen is Distinguished Research Professor Emeritus and Senior Research Associate in the School of Criminal Justice at the University of Cincinnati. Cheryl Lero Jonsonis Assistant Professor in the Department of Criminal Justice at Xavier University.